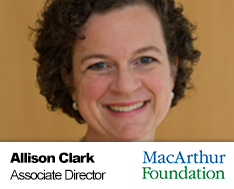 Allison joined the Foundation in 2006 to oversee investments made through Window of Opportunity, the Foundation’s $150-million affordable rental housing preservation initiative. Since then, her responsibilities have expanded to include overall portfolio management for the Impact Investing program. Allison has worked in affordable housing, economic development and commercial real estate for over 20 years. Prior to joining the Foundation, she worked as a senior underwriting manager in the Community Lending Group (formerly the American Communities Fund) at Fannie Mae, where she underwrote and closed more than $150 million in debt and equity transactions for affordable housing developments. She also worked for eight years at Bank One in a variety of departments, including Commercial Real Estate and Community Development Real Estate. Before moving to Chicago, she participated in the Urban Fellows Program in New York City, where she worked as a project manager at the New York City Economic Development Corporation. Recently, Allison served on Attorney General Lisa Madigan’s task force charged with creating and implementing a program to deploy $100 million in grant funds from a national mortgage settlement aimed at addressing the foreclosure crisis. She also serves on the board of directors of the Chicago Foundation for Women and the Chicago Chess Foundation. Allison graduated from Harvard-Radcliffe College with a Bachelor’s degree in Government, and earned a Master of Management degree from the Kellogg Graduate School of Management at Northwestern University with a concentration in Nonprofit Management and Real Estate.